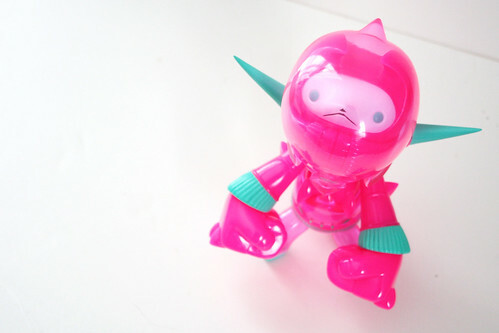 The next thing I purchased is the Sweet Monster Fulcraim by Kaijin. He comes with a laminated certificate that indicates the show he was launched at (Kaijin Exhibition @ One Up, Tokyo, June 9-15, 2008) and is number 67/80. 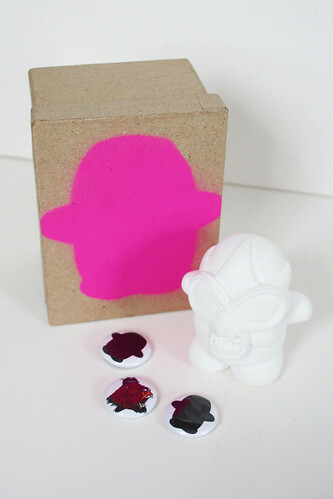 He has two faces and is full of hot pink awesomeness! 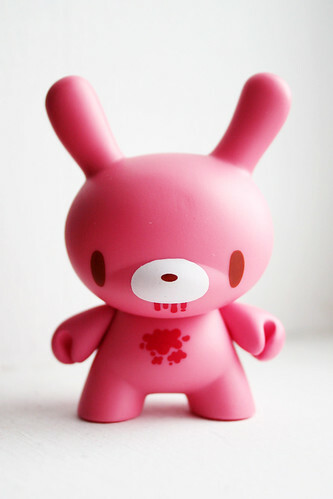 I also picked up the 3 inch Mori Chack Dunny à la Gloomy Bear style from the 2009 Dunny Series. And my friend Troy Stith sent me his DIY Lil’ Lucha Dentadura! Troy hand casts his own resin figures, which I think is awesome. 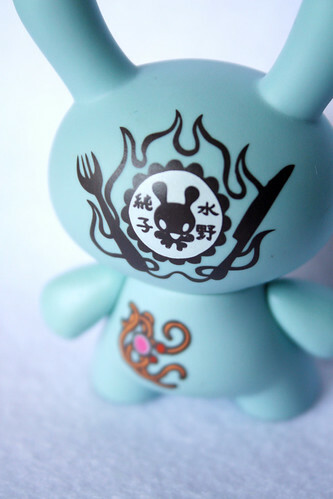 I plan on customizing this little guy soon. 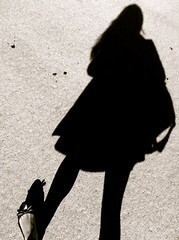 With an artist name like “Follow The White Rabbit”, it’s no surprise that I’m an Alice In Wonderland fan. 😛 But I’m also a huge Tim Burton fan. And now my life is almost complete because Tim Burton is directing the new Alice In Wonderland movie (released in 2010) AND some of my friends are working on it!! The movie looks gorgeous, I really can’t wait to see it in the theatre! Alice in The Garden of Live Flowers. If you look closely, you can see faces in the flowers! Tim Burton is my favourite director of all time. He started out as an Animator at Walt Disney Studios, and worked his way up to become a Director. His resume has lots of my favourite movies on it (The Nightmare Before Christmas, Edward Scissorhands, Corpse Bride, Ed Wood, etc). What I love about his movies is that he’s not afraid to push the boundaries when it comes to artistic direction (even if his story arcs aren’t that strong). I can’t name another director who is either that daring or trusted to go for a super unique look. I also love his gothic twist on things. He truly is a brilliant and inspirational artist. This is a still from the movie Nosferatu (1929). You can see the tone, emotion and intent in this shot just by the light and shadow cast on the wall. The German Expressionists were masters at this art form. If you’d like to read more about Tim Burton, visit his official website (which unfortunately isn’t that great) or The Tim Burton Collective (lots of great info). For those of you in NYC, he will be having an art exhibition at MoMA from November-April! 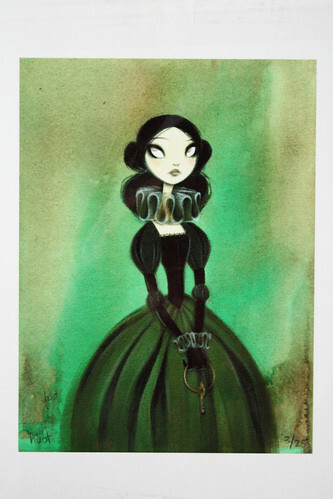 He will also be releasing “The Art of Tim Burton” book soon (which I absolutely must get!!)! Also, Lenny’s Alice In Wonderland site is a great resource for anything Alice (e-books, pics, trivia, etc), one that I use almost all the time! She’s having a solo show at the Magic Pony in Toronto this month, so I’m going to try and check it out if I get the chance. 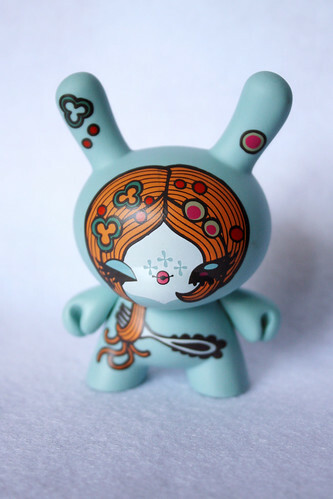 Go and check out the work from the Made In Mexico show that is available in Bear & Bird’s online shop. You just might find a piece of art that is both awesome and totally affordable. 🙂 You can also check out Bear & Bird’s Flickr for pics of the whole show. I’ve listed two new deer in my Etsy shop, and they’re both in colours that have never been available before! 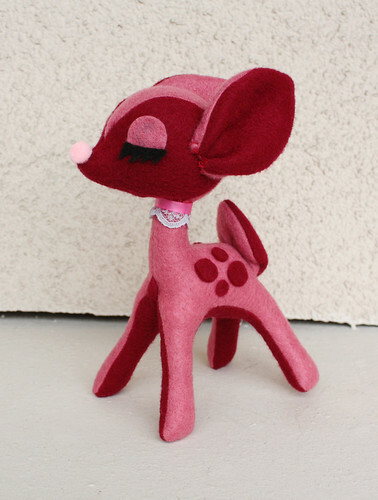 Elegant Eggplant Deer loves to cook and bake vegan meals for her friends. She is planning on opening the first vegan restaurant in Deerville, and wants to name it: “The Elegant Eggplant” after herself. It’s well deserving because her food is to die for. 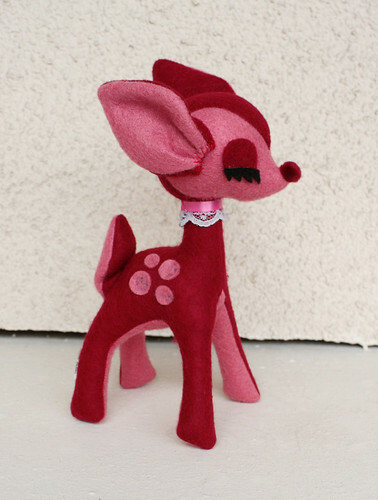 Elegant Plum Deer crochets the most elaborate doilies you’ve ever seen. 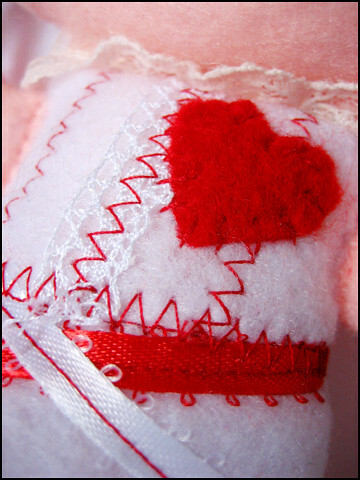 She makes them for all occasions and even gives them to her friends for their birthdays. Some of her friends have accumulated quite the doily collection because of it. 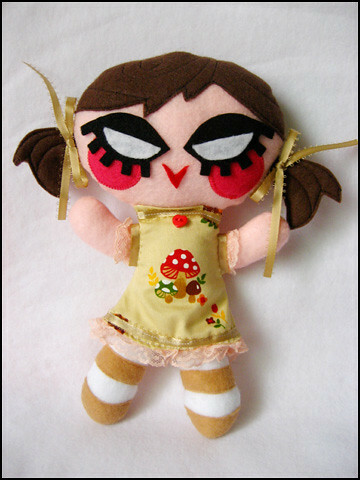 I bought an Anna Chambers plush from the Luvable Hugable 2008 show as an early Christmas present to myself. Hee hee! 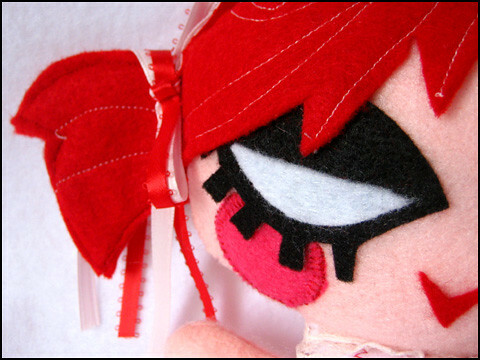 Anna is one of my favourite plush artists as well as a huge inspiration, so to finally own an original creation of hers is sooo exciting. Isn’t he so amazingly cute!!! 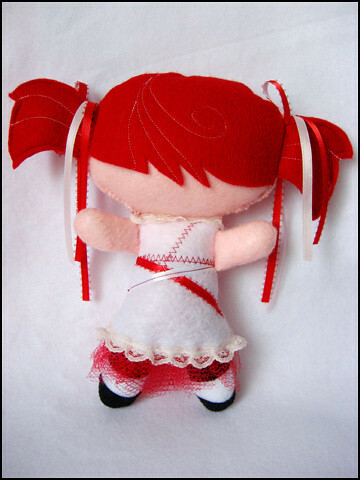 Sekrit plush dolly plans revealed! L>R: Pink Victorian Mistress, Alice in Wonderland, Gothy Sad Girl, Dorothy Gale, Zombie Girl, Shy Heart. L>R: Gloomy Girl, Victorian Mistress, Alice in Wonderland, Dorothy Gale, Snowflake Girl. Next up, instead of diving right into making a plushie (which can be very frustrating for the first time around), I decided to make a felt “sketch” of what I wanted, so I could eventually make a pattern off of the sketch. This way I could see what size things needed to be to look good, and it gave me an idea of what worked, and what didn’t. Things can work great as an idea or on paper, but when translated to 3D, it can be a different story altogether… or even from the felt “sketch” to the final product could have things that won’t work (like the coloured streaks in her hair look kinda neat on the felt “sketch”, but they’re too small to sew onto the hair, so I went with the stitched look instead). 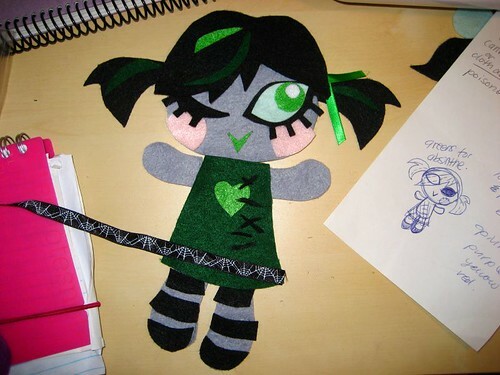 The felt “sketch” is of my Absinthe Zombie Girl. I need to buy more grey felt to actually make her. 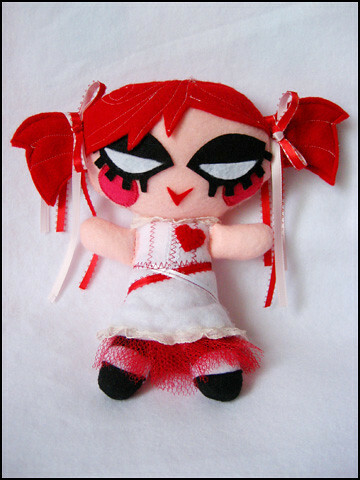 So the next thing was, I made a pattern from Absinthe Zombie Girl, and decided to make my first plush doll based off of Emilie Autumn. 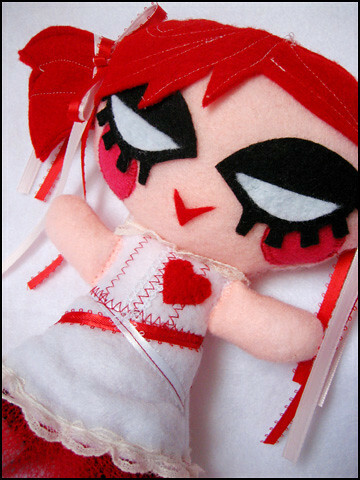 It was soooooooo much fun making her. 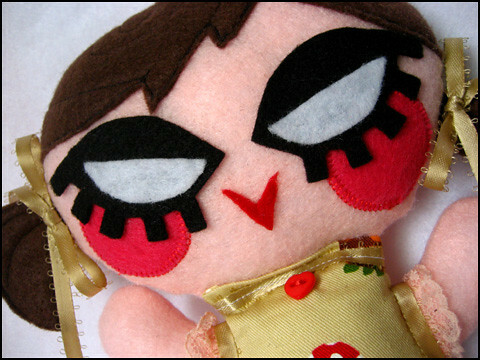 I made her all the way back in September (or was it August? ), but work had such a *huge* crunch, that I didn’t have time to do make anymore of them. Now that I have the time, I can actually start making these for real. ^_^ I’m going to post her at the EA forum, and see what people think. 😛 Posted! 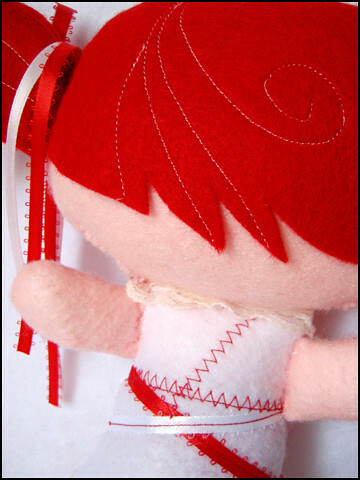 I really like the way that Anna Chambers’ uses stitches instead of an outline or change of fabric, etc to show lines. 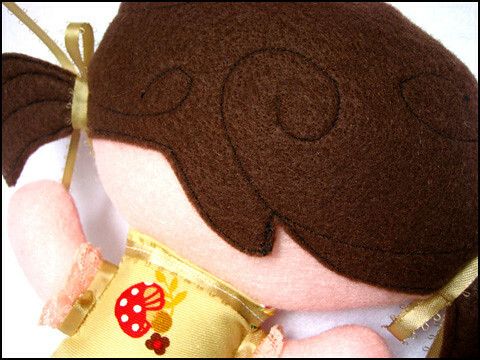 So, I used her idea and added stitches in her hair to show swooping and swirling hair. 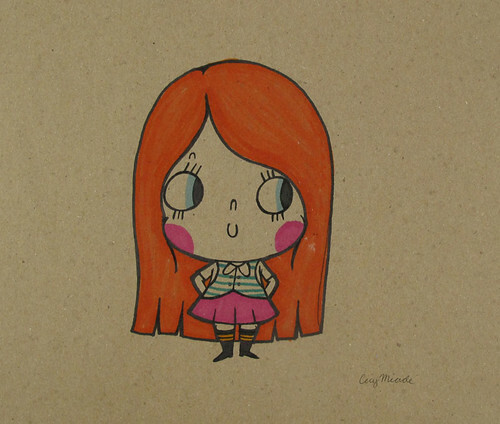 Then I decided that I really should work out what I wanted for the dress/skirt, and I came up with this (below). 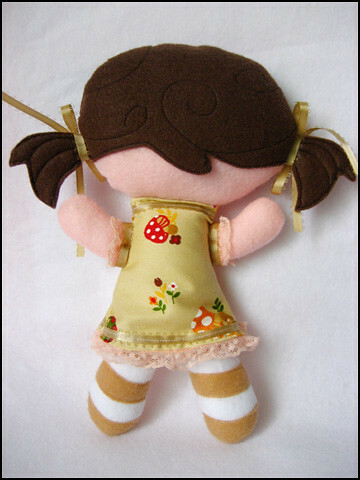 The doll body is the same fabric as the skirt. After the skirt is made, I hand sew it onto the body, giving the illusion that it’s all one piece.